By Barbara Zimmerman, President, B/Z Rights & Permissions, Inc. This is the information you've been looking for — recent popular songs from the 50s and 60s that are in the Public Domain. How is that possible? Their copyrights were never renewed! And you get the benefit of those mistakes. You can use music from the 50s and 60s that made the Billboard Pop Charts for free — no one to pay, no one to ask permission from! Almost anyone who uses music for any purpose ought to own this book, meaning anyone who uses or works with music, including advertising agencies, film and TV companies, entertainment companies of all kinds, attorneys, website owners, schools, or the many others who could profit by using or helping others use the music or lyrics it contains without having to pay a hefty fee! Rockin’ Robin (1958) words and music by Jimmie Thomas, pseud. of Leon Rene. Charted at No. 2 on Billboard’s Top 40 Hits of 1958. Original artist: Bobby Day; covered by The Carroll Brothers, The Outsiders, The Hollies, Freddy Cannon, Michael Jackson, Livingston Taylor, Lolly, The Alley Cats, McFly, Randy and The Rockets, Re-Bops, Raggs Kids Club Band, Party People, Joanie Bartels, Stacy Buehler, Brownsville Station, Countdown Singers, The Hit Crew, Jeff the Drunk, Taj Mahal, Bob Luman, Tommy McLain, Moon Riders, The Muppets, Nine Below Zero, Jim Valley, Gene Vincent, Byran White, Yesterday's Today, The Rivieras, Sha Na Na, Del Shannon, Dee Dee Sharp, Sugar Beats, Tweenies. Registered in the U.S. Copyright Office under EP122611, Sept. 10, 1958; no renewal on file. IMPORTANT - Rockin’ Robin is PD, but Sound Recordings of this song are almost certainly under copyright protection. The 96 songs we have unearthed after intensive research, and catalogued in this book, all made it onto the Billboard Pop Charts. And, according to the Search Division of the U.S. Copyright Office, they’re all in the Public Domain in the United States. Yet, not everyone knows it. In fact, few people do. However, they’ve all been checked and double-checked. Many of them triple-checked. 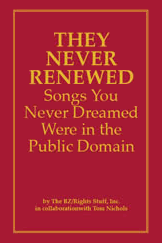 Our company, The BZ/Rights Stuff, Inc., publisher of The Mini-Encyclopedia of Public Domain Songs, has received a report from the Copyright Office concerning each of these songs. They tell us their report confirms that copyright has never been renewed on any of these songs. So, for those of you making a film or TV show, a TV or radio commercial or anything intended for corporate use, including for use on the Web ... and for all of you who, like so many of us nowadays are on a tight budget, this carefully researched reference work represents a chance to use a recognizable, likeable or even lovable melody to enliven and enhance your project — all free of cost! How can this be? Because they are all in the Public Domain, these songs are yours to do with as you wish. Use the words! Change the music! Do anything you want with them! You do not need to get permission, or pay anyone anything. Because no one owns any of these songs. And, why is this so important? Because, if or when a great piece of music comes to your attention, and you think or assume that it is PD when it absolutely IS NOT, and you then use it without permission — you’re infringing, ignoring or violating a copyright owned by someone else. And if you do this, either by accident or error, it could cost you, your company, or others you work with, (such as an employer or a client) a great deal of money. That’s why there needs to be a really reliable reference work ready at hand on your bookshelf that tells you whether or not the piece of music that has caught your eye (or your ear) is safe for you to use, and quite probably profit from. Shouldn’t you order yours today? Price NOW is $99 - just reduced from $299.